Rose of No Man's Land is basically a contemporary rose soliflore, and I think it's a lovely one. Its composition includes top notes of pink pepper and Turkish rose petals, heart notes of raspberry blossom and Turkish rose absolute and base notes of papyrus and white amber. Some of those notes were apparent when I tested Rose of No Man's Land, others less so. The roses smell very pink, if you know what I mean: they're fresh and springtime-y rather than dramatic. The pepper is also very much in evidence and is married very smoothly with the pink rose petals. As Rose of No Man's Land warms and evolves on my skin, I also notice a tangy red-fruit note that reminds me of rhubarb and a grass-greenish note that could be the papyrus, although I have no idea what papyrus actually smells like. This fragrance has above-average longevity and sillage; I've even received a few compliments when I wear it, which rarely happens. (I think most scents tend to quiet down and stay close on me.) The far dry down is a soft, creamy rose note. I'd place Rose of No Man's Land on an imaginary shelf with other elegant niche rose soliflores like Maison Francis Kurkdjian A la Rose and Parfums DelRae Coup de Foudre. I admired those fragrances, but didn't fall head-over-heels for them; Rose of No Man's Land, however, has a little something "extra" that makes me want to keep wearing it. 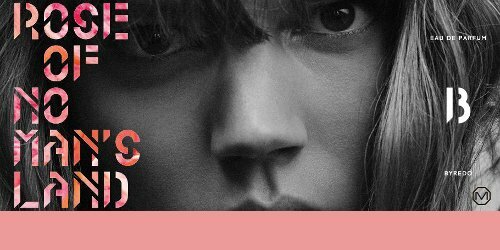 Byredo's Rose Noir has been one of my most-worn fragrances of 2015, but I can imagine myself purchasing a small bottle of Rose of No Man's Land when spring rolls around again. A portion of Rose of No Man's Land's global profits will be donated to the Swedish division of Doctors without Borders/Médecins Sans Frontières, as an appreciation for today's medical caregivers in war-torn regions. Bonus reading: a short article about World War I nurses at The Express. Byredo Rose of No Man's Land is available as 50 ml ($145) and 100 ml ($220) Eau de Parfum. For purchasing information, see the listing for Byredo under Perfume Houses. 1. From the song Rose of No Man's Land by Jack Caddigan and James Alexander Brennan, 1918. Gosh, you piqued my interest!! I really, really like it. I’m not a big fan of all Byredo’s florals — I really don’t care for La Tulipe or Inflorescence — so this one surprised me a bit. Makes me want to by it unsniffed (eventhough I’m fairly finicky about my roses) just because I’m an RN. That bonus reading was really interesting. Especially that bit about Agatha Christie joining the ranks. And that photo of her is so moving. Thanks so much for reviewing! I loved that photo of A Christie, too! Is it just me or isn’t it a bit naff to pay ‘tribute’ to WWI nurses in 2015? Sure, ‘no man’s land’ sounds romantic enough to those (including myself) who’ve never witnessed the terror of full-on war in their lifetime and it will help shift units and for a good cause, but still … it reminds me of Facebook petitions and easy online clicktivism. No man’s Land doesn’t sound the least bit romantic to me. Unfortunately, nurse have always been under appreciated and under valued. I’m happy when they get ANY recognition. That’s definitely true — they’re heroes (heroines) and they deserve all the credit they can get. I don’t have an issue with a company giving credit to nurses and the work they do. It just feels like Byredo’s making a statement without really making a statement by picking an event to so far back in history as to be totally safe and non-committal. Lord knows the world is full of conflicts. Why not name your parfum Rose of Aleppo or Chechny to raise awareness? I think they put their money where their mouths are by donating a portion of the sales to DWB. I was glad to see that — such an important organization. Not every perfume house that mentions a social issue actually backs up their verbiage with action. I think between 2014 and 2018 there will be all sorts of commemoration of/tributes to those who served in WWI. I know I found the Tower of London poppies last year to be very moving. I know an SA at Barneys and she told me about this when it first came out and I now own a bottle. I agree that there is something compelling about it that I don’t feel in other rose perfumes that I own. Unfortunately, I believe it is a limited edition. Ooh! A connection — always a good thing to have! I’ll be sad if it turns out to be a LE. I read Testament of Youth as a teenager, as well as Terstament of Friendship and Testament of Experince. Outstanding books to read because they really delve into a war that changed the world and its effect on the human psyche. I’m not a rose fan, but may test this. These titles are new to me! I’ll have to look into them. Hm, that’s actually a really interesting comparison! Not as much rhubarb as the CdG, but if you like that one, you should give this one a sniff! The tangy red fruit note is worrisome for me; things have a tendency to go sour on my skin without being sour right out of the gate! Other than that it sounds right up my alley, and the backstory and donation it even more appealing. I know what you mean — some fruit notes don’t work on me, either. But I hope you’ll have a chance to sniff it anyway! Anyone have any idea of the percentage donated? I haven’t seen specifics, no — but I’ll keep an eye out and update if I learn anything else. our little family donated to Doctors without borders. Its a very nice gesture. Though I am tempted to buy just because of that, I am way to picky about my rose perfumes. They do such important work — and there’s more and more need for their work, alas. I am realizing that I haven’t even tested Rose Noir yet! I usually read science fiction and murder mysteries, so what I know about WW I nurses is mainly drawn from the Maisie Dobbs mystery series. She (the main character) was a nurse during WW I before working as a private detective after the war. I had always assumed that it must have been horrific but that medical personnel were at least in safe locations, but not so. And sadly today the even the best precautions are no guarantee. I’ll make a particular effort to sample this. I might have already asked you this during some of the book posts but have you read Charles Todd’s Bess Crawford series? Also a WWI nurse solving murders, but the stories take place during the war rather than after. If you like Maisie Dobbs, I think you’d like Bess. I need to read ALL these, ahhhhh! If you are interested you might want to try the “Regeneration” trilogy by Pat Barker. It mostly focuses on the soldiers though. Rapple and austenfan, thanks for these suggestions! This one sounds nice. I’ll give it a go if I see it. There’s been a small fuss in Australia about this perfume, the criticism being based on the exploitation of tragedy and suffering for the purposes of making a profit. Unfortunately, the fact that a portion of the profits will go to MSF has not been reported, as far as I can tell. That’s an interesting criticism — *so* many perfumes are inspired by historical moments that were actually violent, politically oppressive, sexist, etc. etc. Singling out Byredo doesn’t make much sense! I remember visiting the Imperial War Museum and going into some kind of installation that evoked the experience of the London blitz. We all sat on boxes in a dark “basement” and heard the recorded sounds of explosions and smelled the aromas of explosive powders, burning buildings, etc. It was actually quite unnerving. I think the sensitivity here is in the context of the centenary of the First World War, which is HUGE in Australia at the moment. There is a lot of commercial product out there leveraging off war themes. 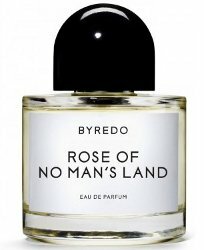 A lot of it is way less tasteful and respectful than what Byredo is doing, so I think that the negative reaction to A Rose in No Man’s Land is based on that old idea that perfume is a useless, ‘frivolous’ product. Thanks for these perspectives, annemarie. The First World War centenary hasn’t gotten that kind of coverage in the U.S. that I’m aware of (but then I don’t have a television so I could underestimating). After so many “Prix Eau Faux” type back stories, I appreciate Byredo’s dedicating this one to WWI nurses. And as someone else said, Byredo put their money where their mouths are by donating to DWB, a very good cause. I might even be over being traumatized by Pulp to try this one. It actually sounds very nice. My God, Being Offended will soon be an Olympic sport. I cannot believe the things that get people’s backs up these days. Oh I like this one! You’re right, it’s a modern rose soliflore, but it’s still got something extra that makes you go back and sniff. My fave from the Byredo line is probably Bullion, which is plummy and leathery and delicious.